Watch Door Armor get put to the test. This shows how durable and strong Door Armor is and why it's recommended by police. Following a rash of break-ins in Buena Vista Township, Michigan, police found Door Armor at a local Lowe's store and decided to put it to the test. A local CBS affiliate captured and aired the test on the evening news. We actually found out about this test several months after it aired. 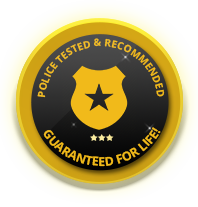 While we have never solicited a police endorsement, we received one from the police officers, who tested our product. It was Thursday evening at around 6 o'clock when we received the call back in 2008. Channel 3 News in Memphis, Tennessee had put our Door Jamb Armor product to the test. They called us after the test had been completed. Since we had no idea that they were even conducting a test, we were relieved to hear how impressed they were. "I have tested hundreds of products. Most don't live up to manufacturer's claims. Some might come close to doing what the manufacturer says. I have never tested a product that exceeds the manufacturer's claims by this much. We are very impressed" Kris Anderson, WREG Anchor. One of our dealers did this test several years ago. They were not sure that Door Armor would work so they decided to put it to the test before recommending it to any of their clients. Maintenance personnel at the Dallas Housing Authority did not believe that Door Armor would work. After a number of kicks they all agreed that Door Armor was the real deal. We might be able to give them some coaching on their kicking technique but none of these men believed that the Door Armor would work. The Mobile Housing Authority was experiencing kick-ins on many of their vacant properties. Many of the maintenance people and administrators did not believe that the solution would work. We sent them a sample kit and had them test it for themselves. With a large crowd standing by, they kicked and beat the door with a sledgehammer until they broke a hole in the door itself. Another test done by maintenance personnel, who did not believe that Door Armor would work. see for yourself what happens. For years, the pritchard housing authority had accepted kick-ins and vandalism as a way of life. When we presented them with Door Armor, they did not believe that it would work. Their maintenance supervisor actually laughed at us when we told them that our solution would stop kick-ins. He promised that "his guys" could kick it in". See for yourself what happens. Another apartment community in Houston. Maintenance guys didn't believe that Door Armor would work so we sent them a sample and told them to "have at it". Following this test, they fortified their entire community with Door Armor.